Di-Calcium Phosphate, Microcrystalline Cellulose, Stearic Acid, Croscarmellose Sodium, Silica, Magnesium Stearate, Maltodextrin, Hydroxypropyl Methylcellulose, Propylene Glycol, Titanium Dioxide, FD&C Blue No 2. 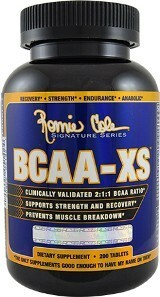 Take 4 BCAA XS™ tablets with 6-8oz of water to aid in absorption. Use in conjunction with a proper diet and exercise regimen to maximize results. KEEP OUT OF REACH OF CHILDREN. Must be 18 years of age or older to purchase and/or use this product. Before taking BCAA XS™ or any dietary supplement seek advice from your physician if you are unaware of your current health condition, have any pre-existing medical condition(s), taking any medication(s), planning any medical procedure, pregnant, nursing or contemplating pregnancy. This product may contain chemicals known to the State of California to cause cancer and/or birth defects or other reproductive harm. Reduce or discontinue use if you have any adverse reactions such as but not limited to gastrointestinal irritation. Keep out of reach of children and pets. Store in a cool, dry place. Protect from heat, light and moisture. "Branched Chain Amino Acids are named for their unique branched chemical structute and are classified as essential amino acids, meaning that the body cannot produce them by itself. Therefore these three BCAA's (Leucine, Isoleucine, Valine) must be acquired through your diet or supplementation.